Los Elementos Adventure Center is the rock climbing school in Guatemala where you can learn the basic principals of top rope climbing and try your skills on one of our easier walls. We offer a unique opportunity for over-the water climbing for those with more experience. Rock Climbing adventure – family friendly activity; come for a day or a week. We have our very own Rock Climbing camp with routes for any ability. 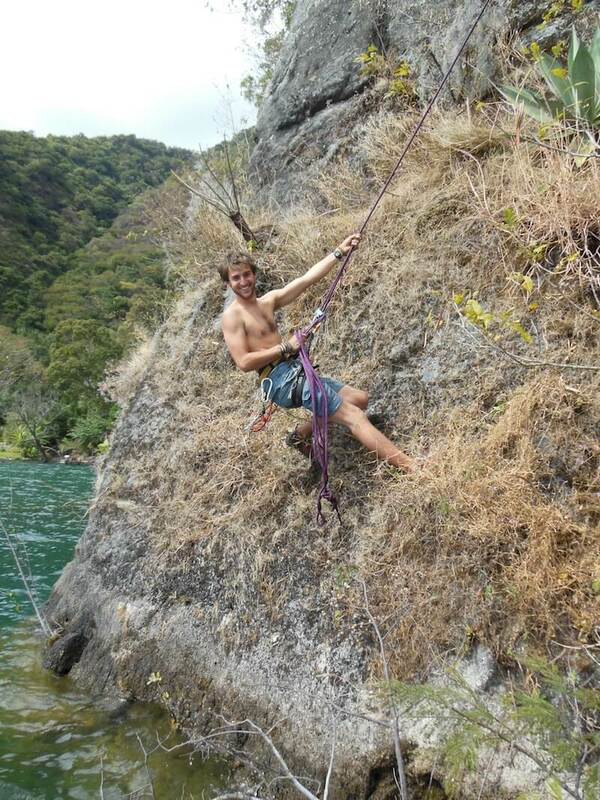 Climb with us at the base camp in Santa Cruz la Laguna, or on one of the many climbing sites around the lake. Lake Atitlán is one of the few of locations in the world with over-the-water climbing. We have 2 top-rope climbs(one pitch each), 1 canyon climb(three pitches), and over the water climbs(one pitch each). All of these climbs involve not only rock climbing but also tree and dirt climbing. We can do all in 1 day, break it up, or just do some of them. $70 per/person: 2 top-rope climbs – Estimate up to 3 hours. Family packages available, just ask us for special pricing. Top rope climbing (or top roping) is a style in climbing in which the climber is securely attached to a rope which then passes up, through an anchor system at the top of the climb, and down to a belayer at the foot of the climb. The belayer takes in slack rope throughout the climb, so that if at any point the climber were to lose their hold, they would not fall more than a short distance.. It is the most common style used at indoor climbing walls. Sport climbing is booming! In recent years, climbing has truly become a popular sport, not least because of numerous climbing gyms: more and more athletes are attracted by vertical challenges, both indoor and outdoor, and the trend continues. For a very good reason: climbing does not only train most of our 656 muscles, it challenges the mind, too.